Here is a new Mother Bear idea that I wanted to share. Add a flower skirt to your bear. I crocheted this Mother Bear body all in BLO and added this skirt to finish off my bear. The head is crocheted in both loops. This bear was crocheted using Red Heart yarn in a Flamenco stripe skein to crochet the Mother Bear. Then I added a skirt around the waist using some plum Love This Cotton yarn. I had just a small piece of the Flamenco stripe yarn left in pink so used that for the reverse SC trim around the bottom of the skirt. I received a wonderful box of yarn from an on-line friend filled with Red Heart Stripes yarn. There are about 6 different varieties of the Stripes yarn in the box. I started out using the Fruity Stripe colorway to crochet this first Mother Bear. I use the Mother Bear Project seamless crochet pattern and crocheted all in the BLO for each of these bears. I also played around with the skein to avoid using the yellows and golds which I saved for the next bear. Next came Anna Mother Bear using the yellow and golds in the skein. Anna bear is sporting a pretty fuchsia shell skirt. Here is the free Mother Bear skirt pattern I used for her skirt. I just finished crocheting my first Mother Bear for the year. I haven’t had too much time lately to work on bears for the Mother Bear Project but did want to crochet one more bear to ship off to the organization. Here is Mr. Bare Bear who was crocheted using a partial skein of Yarn Bee Fair Isle yarn in purple teal multi colorway. I tried to match a few areas as I crocheted the parts of the bear so there was some matching of colors. I added a simple scarf using the same skein of yarn. This bear uses the crochet pattern from the Mother Bear Project but it has been adapted to be seamless and without joining. You can read more on my mods of the original crochet pattern here if you’d like more info. I just took a break from my other crocheting to make a bear for the Mother Bear Project. Meet Sunshine bear crocheted seamless and in the round. He’s a bare bear crocheted in his jammies with sleepy eyes. This is bear number 23 that I have crocheted for this worthy and rewarding charity. If you aren’t familiar with the Mother Bear Project, you can check them out at their official website here or join us over at Ravelry for all the bear making fun. I present Donald my latest crocheted bear for the Mother Bear Project. 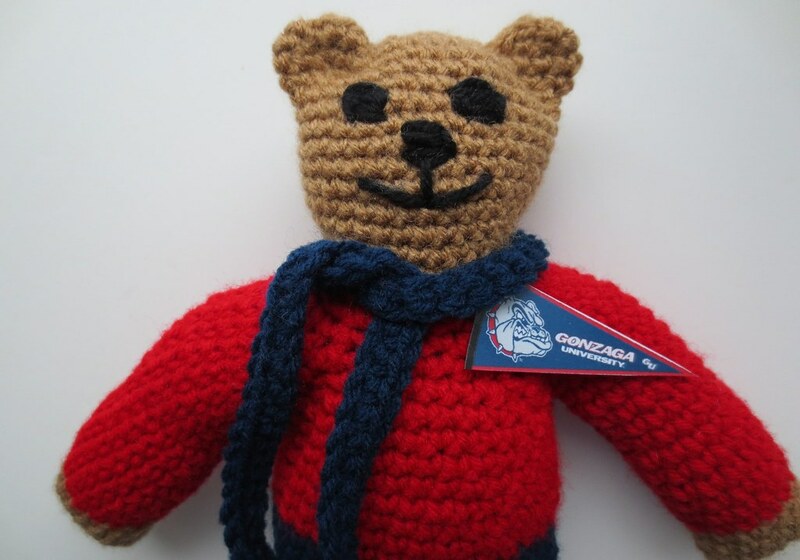 I crocheted this tribute bear in honor of my late uncle who was a big Gonzaga basketball fan. He would be some proud and excited about the Zags making it to the Final Four and for playing for the National Championship. I crochet my Mother Bears in the round, seamless. 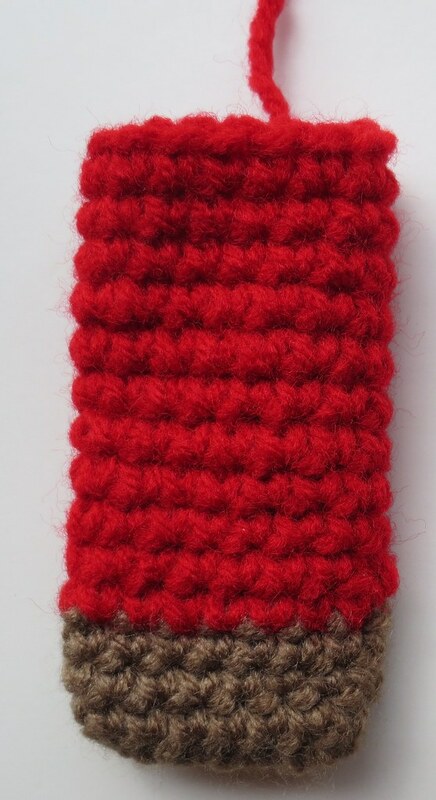 I have a picture tutorial here to show how I crochet the pattern without turning or joining. For more info about the Mother Bear Project, check out our Ravelry group here. 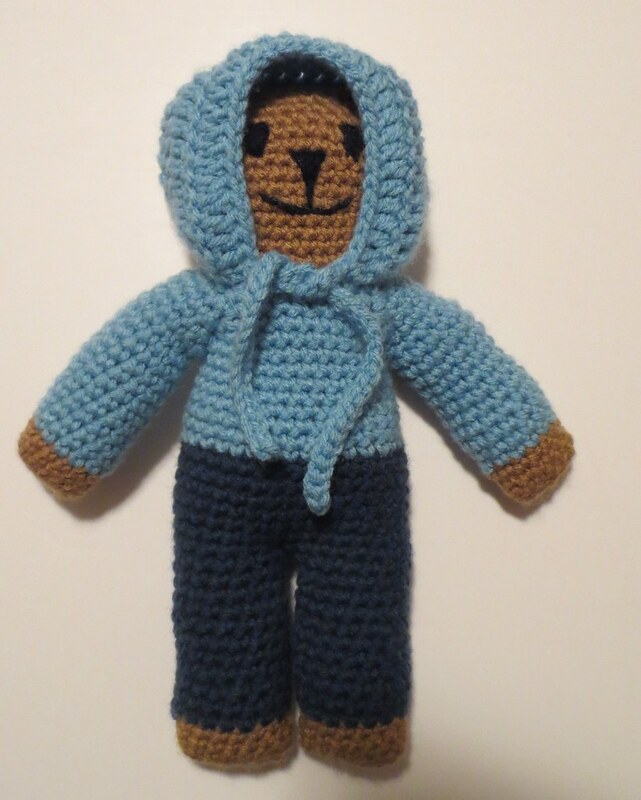 Here is my latest Mother Bear I crocheted with a hoodie. This bear was crocheted for the Mother Bear Project and features a hood with ties. My original Mother Bear hoodie pattern did not include ties. 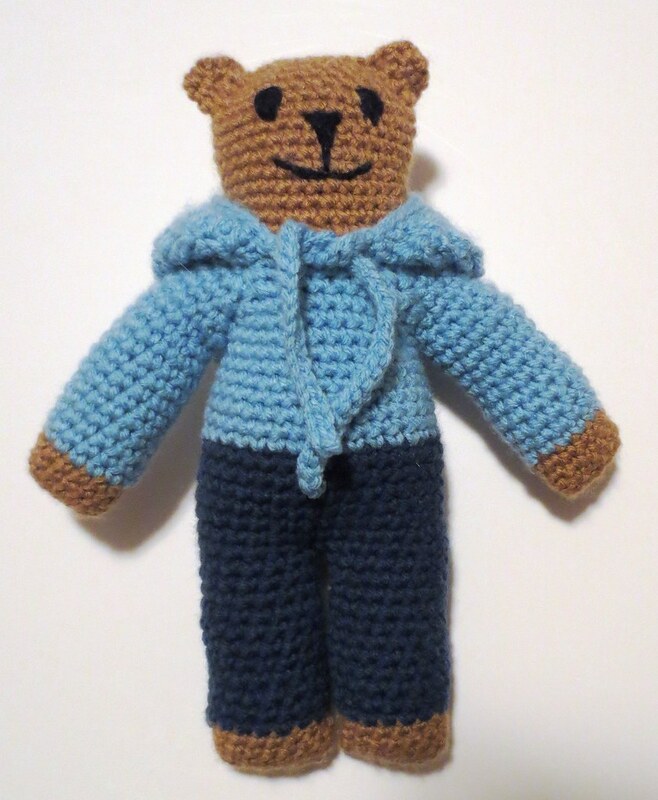 Another Mother Bear crocheter on Ravelry, TeaLover, added ties to her bear’s hoodie after crocheting my pattern. I just loved how the ties turned out. It is like a built in scarf and looks so cute on the hoodies she made. So with her help, I added ties to my hoodie pattern too. This is post to help those using the seamless crochet pattern for the Mother Bear Project. I purchased the seamless crochet pattern from the MBP site. After participating in a CAL for the bears, several of us found some valuable tips to help in crocheting the seamless bears. I want to share with you all the helpful ideas and pattern tips that we want to pass along. I love to crochet in the round without having to turn or join. So after getting the seamless crochet bear pattern, I set out to figure out a way to do just that. Go to the official Mother Bear Site by clicking on the logo below. So as I have stated, I wanted to crochet my bear in the round without joining or working chain 1s for each row. Here is a leg piece to show the outcome. This particular leg has just 4 rows in the bear body color and then 11 rows for the pants up to the point where you join the legs together to work the rest of the pants. This varies from the original pattern but depending on your yarn, design, and other factors, crochet as needed to obtain the size and design you desire. 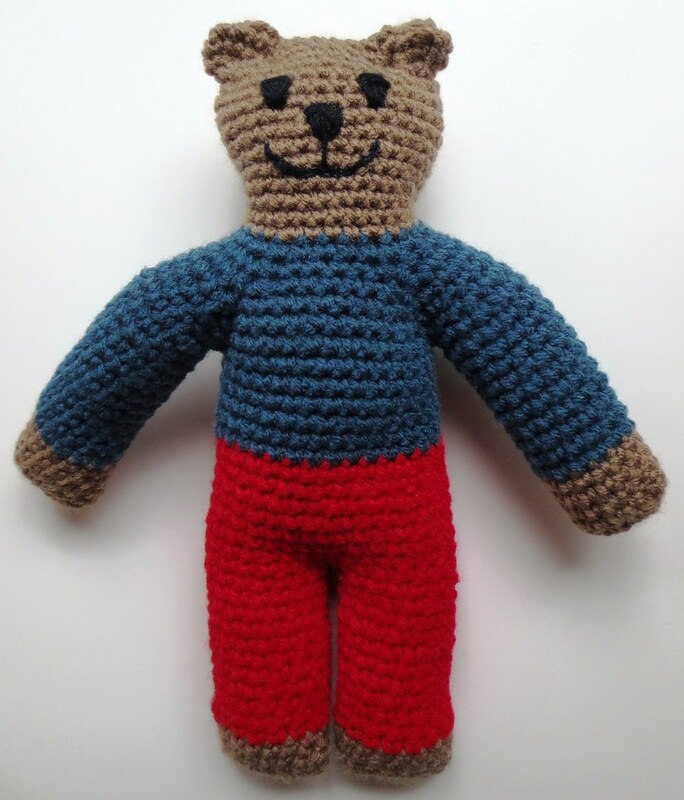 If you read my last post, you know that I have been busy crocheting Mother Bears for the organization that sends teddy bears to children in foreign countries. 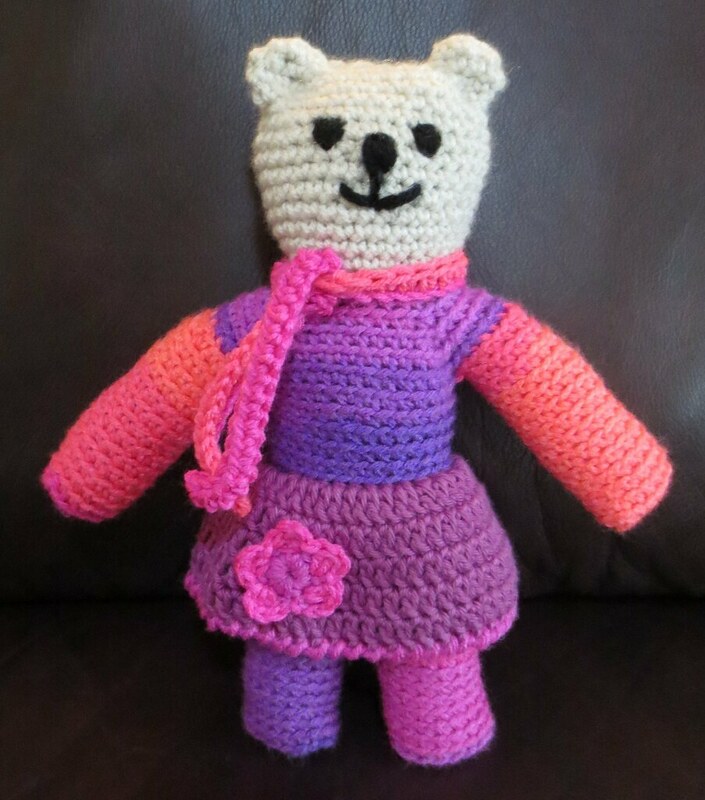 I crocheted a Mother Bear hoodie on one teddy bear and then crocheted this girl bear with a skirt and bloomers. This bear and her clothing were crocheted using medium weight acrylic yarn. The basic bear was crocheted using the seamless crochet bear pattern found at the Mother Bear Project site. 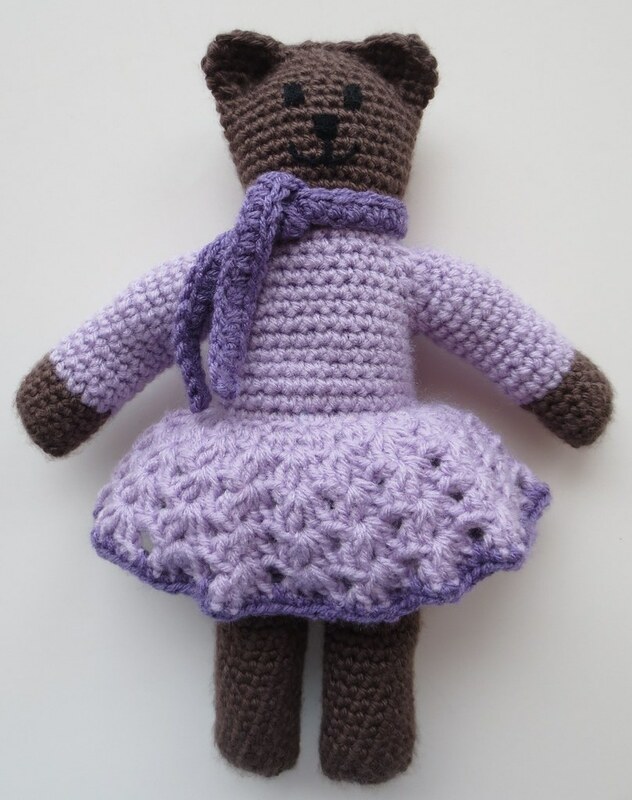 My pattern details are a guideline for adding the skirt and bloomers but make sure you check your fit on your bear as you crochet. I crocheted the skirt with a G (4 mm) crochet hook. Attach at back of waist on bear and follow pattern directions below. I crocheted the skirt working from the waist down and crocheted with the bear upside down as I added the skirt. © 2016 My Recycled Bags.com - Powered by Wordpress.